Les députés ont adopté, le 21 mai 2015, à l’unanimité des amendements au projet de loi sur la transition énergétique qui visent à limiter le gaspillage alimentaire. Le texte prévoit d’empêcher les moyennes et grandes surfaces de rendre impropre à la consommation les invendus. 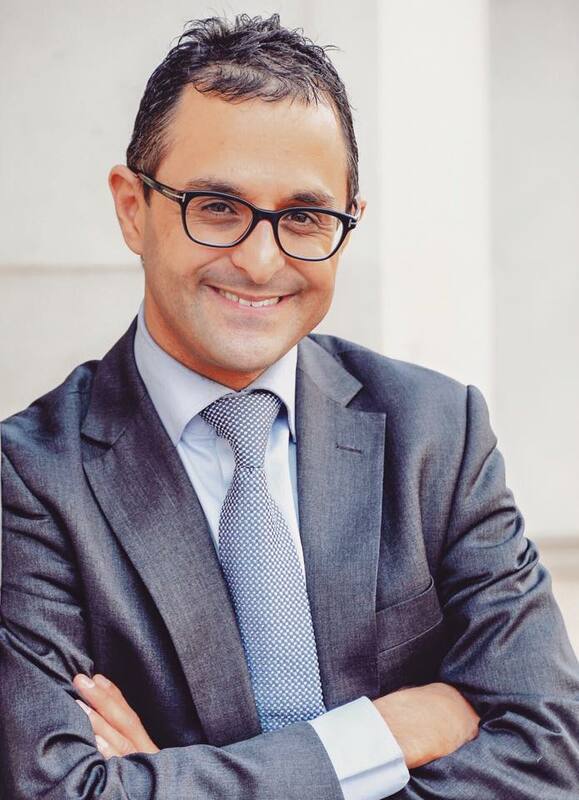 Une loi félicitée par le conseiller municipal (UMP – Les Républicains) à Courbevoie (Hauts-de-Seine), Arash Derambarsh, qui qualifie la décision le vote d’« Historique ». Il avait milité pour obtenir cette loi. Il a été reçu deux fois à l’Elysée le 5 mai et le 11 juin. L’objectif est maintenant d’obtenir une directive européenne afin que tous les habitants de l’UE puissent manger à leur faim. For three nights every week in the months of December and January, along with friends and volunteers in my town of Courbevoie, we recovered unsold food from the Carrefour Market Charras supermarket, for distribution to needy people, especially the middle class and the homeless. 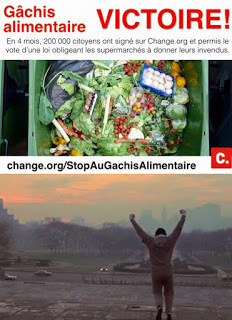 Thanks to this experience, along with my friend Mathieu Kassovitz, who is knowledgeable about this issue, we decided to start apetition on Change.org for legislation requiring all French supermarketsdistribute their unsold food. As of today, more than 210,000 people have signed it ! It has received more signatures than any other ‘ecological / agriculture’ petition on an online site in France. Why create a law ? • On the one hand, a middle class that has more and more economic problems. Indeed, from the 10th of each month, millions of French are out of money after paying their rent and expenses. In addition, there are more and more homeless on our streets. 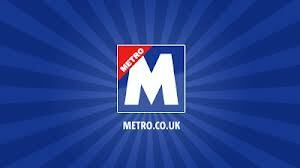 • On the other hand, every supermarket throws away more than 40 kilogrammes of food every day. This is unthinkable with the current economic crisis ! Our proposal was therefore simple and effective: to pass a law requiring or incentivising supermarkets to give – night after night – all their unsold food to the association of their choice. 1. Every citizen can create an association and file the articles (validated beforehand by the prefecture) to its town hall. 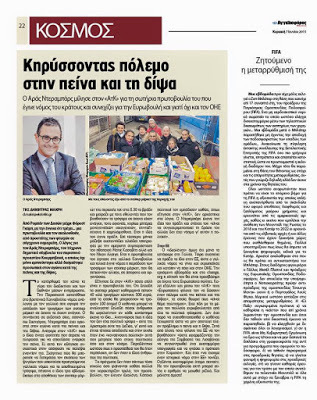 This could then apply to the store of choice in its area, asking that it hand over its unsold food for distribution (as with our initiative in Courbevoie). There will be two kinds of associations for the distribution of food : approved associations that can store items (such as the charities Secours Catholique, Secours Populaire, the Red Cross and so on) and approved corporations that cannot store food because of lack of a cold room. In this case, the organisation would immediately distribute food the same evening (as with my association, Courbevoie 3.0). 2. Each municipality may inform its citizens about this initiative. This will mobilise many volunteers, just like I did in Courbevoie (through contributions to the Courbevoie magazine and communication via Facebook, Twitter). 3. The surplus food will be automatically transferred to approved associations that can store it. This is important as, at the present moment, the Restos du Coeur [a French charity that delivers food packages and hot meals ], like other charities, is having to carry out food drives to acquire. This proposal, which we field tested in Courbevoie, can eradicate some of the hunger in our country. Many parliamentarians and elected officials, from both the right and left, support our approach, as do many celebrities such as Johnny and Laetitia Hallyday. The deputy mayor of our town, Jacques Kossowski, for instance, supported me, and I thank him warmly. There is a real national unity around our request. 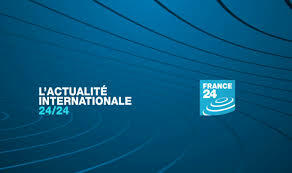 We also received valuable support from the association France ONE, the NGO founded by Bono, the lead singer of U2. Indeed, our struggle is international and could be used in other continents. We presented this initiative on 28 January and 17 February at the National Assembly. 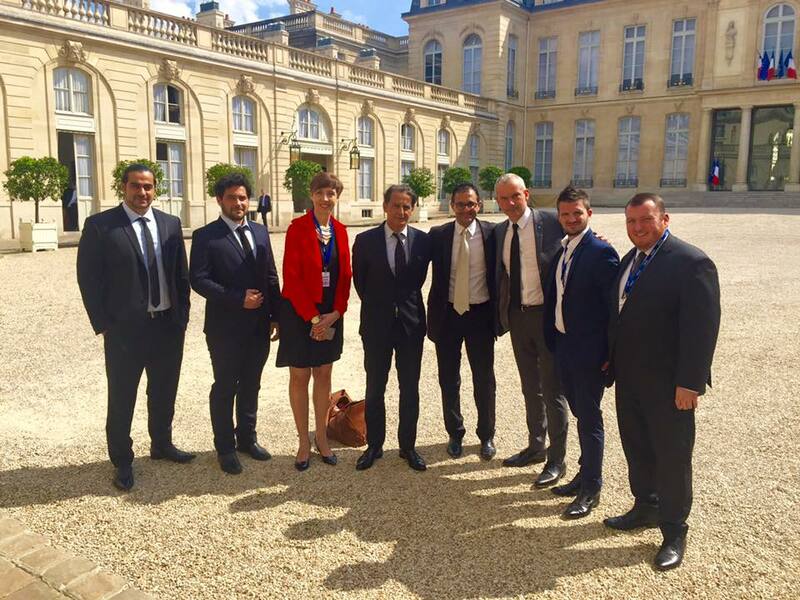 And on 5 May, we were received at the Élysée Palace, where I received the support of the President of the Republic for our petition. Our petition was passed unanimously on Friday, 10 April in the Senate as part of the law called ‘Macron’. The Union of Democrats and Independents (UDI) Senator Nathalie Goulet inserted an amendment into the law, and the Senate voted unanimously in favour of this legal framework for the direct distribution of unsold consumables with two clarifications: this concerns supermarkets over 1,000 square metres, and they will be able to partner with the association of their choice. The Macron law will be officially passed in late June. Moreover, the Socialist deputy Guillaume Garot has fully summarised our petition in its report. It was not easy because he was opposed to parts of our proposal, but we persuaded him thanks to our arguments, and above all, thanks to the pressure of public opinion. In parallel with the Macron Act, a law on ‘energy transition’ is being presented for a final reading at the National Assembly. UMP MP Frédéric Lefebvre, along with others (including UDI MP Maurice Leroy), decided to seize the opportunity to insert various amendments thereto, including the same one inserted in the Macron Act. Through this, all supermarket brands will be required to give their unsold food to the association of their choice. The goal is to pass the provision as quickly as possible. And the ‘energy transition’ law is being passed at this very moment. It is a victory, as all the groups have agreed to vote for it. 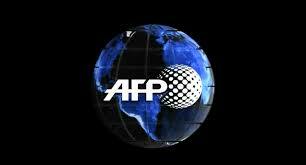 The aim will then be to explain the applicability of the law to the French people. I was in Saint-Maur a few days ago, and then I was at a festival in Brides les Bains (in the Rhone-Alpes region) from 5 to 7 June. This initiative, which came from my town of Courbevoie, could be applicable in all of France. This law, for which I fought for many long months, will allow all the middle class and the poor to eat and drink without the fear of whether or not they can afford it. And we will finally see the end of scandalous images of bleach being used on unsold food to prevent its consumption. In the coming days, we will perform the same action at the European level. In Europe, more than 100 million people live below the poverty line. So, along with Change.org, we’re going to gather the signatures of one million European citizens, and, through the permissions of the Lisbon Treaty’s Citizens’ Initiative, call for a European directive that will require all supermarkets in Europe to pass on their unsold supplies. Brotherhood still has meaning. de gauche à droite : Kamran Rahimian (producteur), Dorian Dreuil (Action contre la faim), Stéphanie Rivoal (Présidente Action contre la faim), Patrice Biancone (Conseiller du Président de la République), Arash Derambarsh (élu dans la ville de Courbevoie), Antoine Boutonnet (Croix Rouge française), Jérémy Brouillaud (Courbevoie), Olivier Rio (Courbevoie) C’est la deuxième fois, après le 5 mai qu’Arash Derambarsh est reçu à l’Elysée. 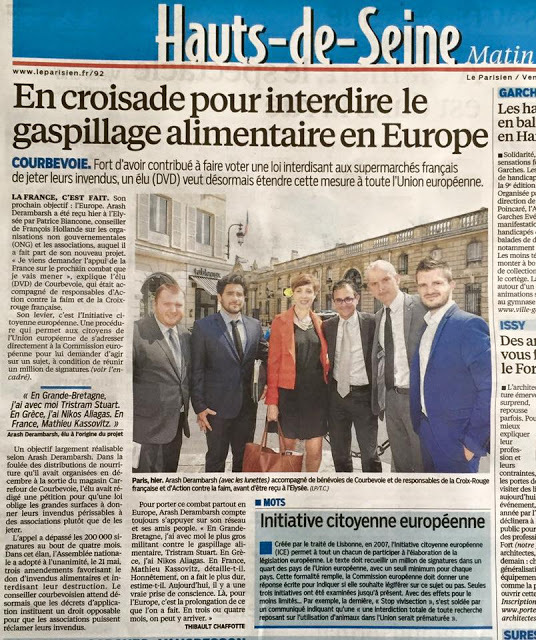 La presse internationale félicite Arash Derambarsh et salue la loi sur le gaspillage alimentaire votée en France ! A councillor whose campaign against food waste led to a law forcing French supermarkets to donate unwanted food to charity has set his sights on getting similar legislation passed globally. Arash Derambarsh said it was “scandalous and absurd” that food is wasted and in some cases deliberately spoiled while the homeless, poor and unemployed go hungry. 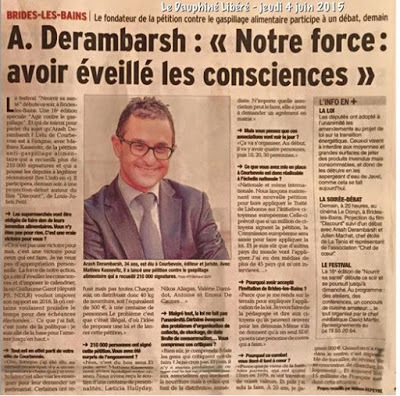 Derambarsh – a municipal councillor for the “Divers Droit” (diverse right) in Courbevoie, north-west of Paris – persuaded French MPs to adopt the regulation after a petition gained more than 200,000 signatures and celebrity support in just four months. The amendment was approved as part of a wider law – the Loi Macron – that covers economic activity and equality in France and is expected to be passed by the national assembly on Tuesday, entering the statute books shortly afterwards. It will bar supermarkets from throwing away food approaching best-before dates and deliberately poisoning products with bleach to stop them being retrieved by people foraging through bins. 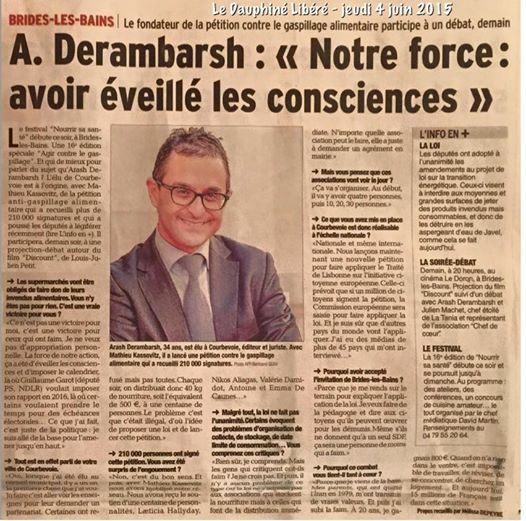 Now Derambarsh wants to convince European countries and the wider world to adopt similar bans. 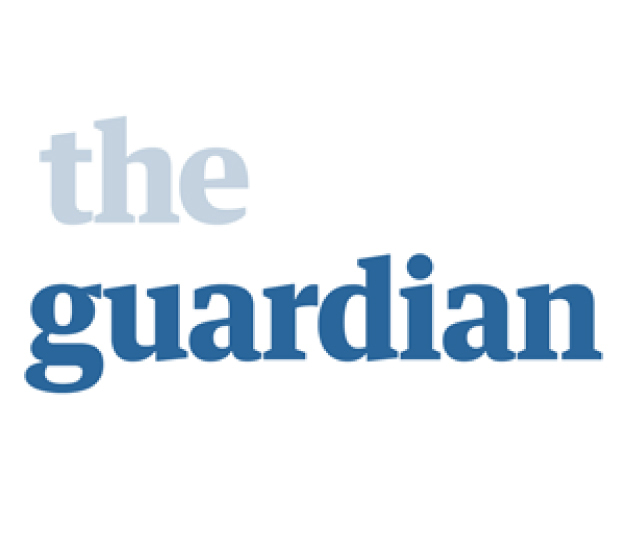 “Food is the basis of life, it is an elementary factor in our existence,” he told the Guardian. “I have been insulted and attacked and accused of being naive and idealistic, but I became a local councillor because I wanted to help people. Perhaps it is naive to be concerned about other human beings, but I know what it is like to be hungry. 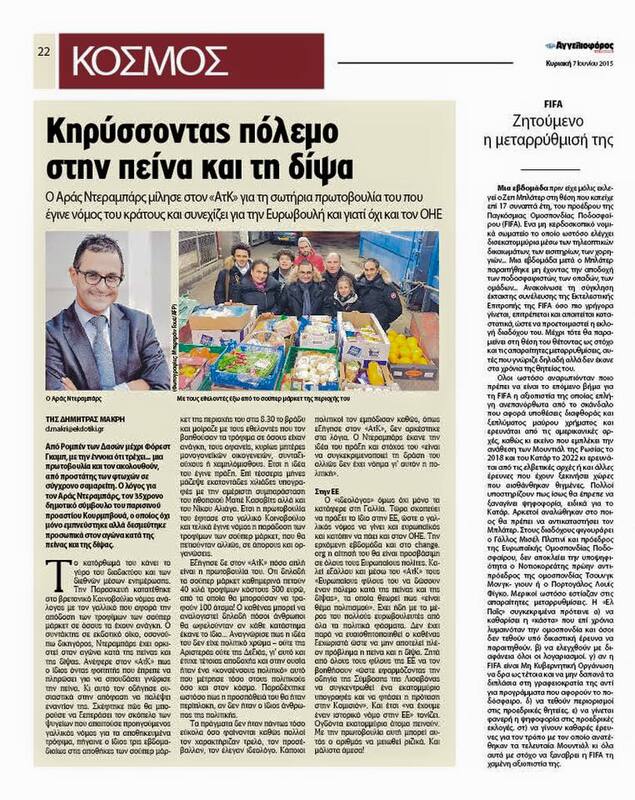 Derambarsh started his campaign by collecting and distributing unwanted food from his local supermarket. “Every day we’d help around 100 people. Half would be single mothers with several children, pensioners or public workers on low salaries, the other half would be those living on the streets or in shelters,” he said. Derambarsh is planning to table the issue – via the campaign group ONE, founded by U2 singer Bono – when the United Nations discusses its Millennium development goals to end poverty in September as well as at the G20 economic summit in Turkey in November and the COP21 environment conference in Paris in December. An estimated 7.1m tonnes of food is binned in France each year – 67% of it by consumers, 15% by restaurants and 11% by shops. 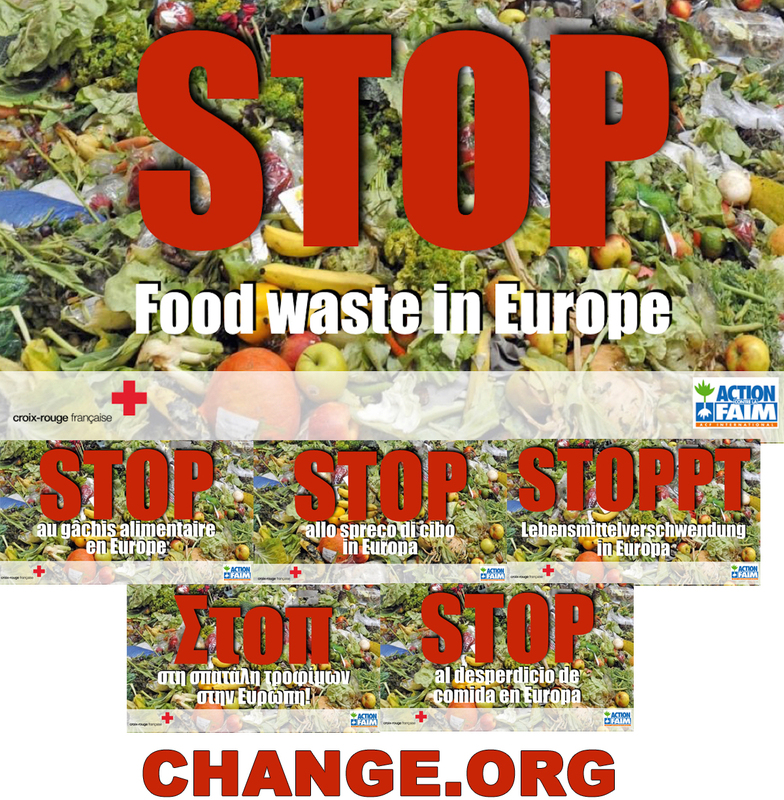 The figure for food waste across the EU is 89mtonnes while an estimated 1.3bn tonnes are wasted worldwide. 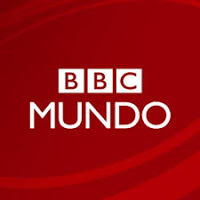 – T13 (Chili) El hombre que consiguió que los supermercados en Francia no boten alimentos Arash Derambarsh, logróque los supermercados franceses donen los alimentos que no venden aorganizaciones de caridad. – Quality unearthed (Pay de Galles – Wales) Meet Arash Derambarsh, the councillor who is wagingwar against food waste in France, and now further afield ? – Courrier International Gaspillage alimentaire: le Royaume-Uni suivra-t-il l’exemple français ? 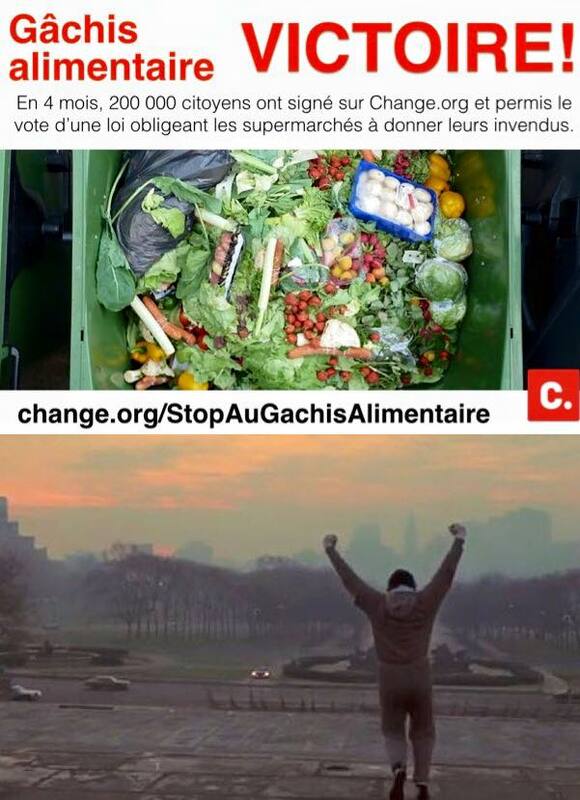 La loi sur le gâchis alimentaire votée : de Courbevoie à l’Assemblée Nationale! Durant les mois de décembre et janvier, avec des amis et bénévoles de ma commune, Courbevoie, nous avons récupéré trois soirs par semaine les invendus du supermarché « Carrefour Market Charras » de Courbevoie, pour les distribuer aux personnes nécessiteuses, notamment la classe moyennes et les SDF. Fort de cette expérience et avec mon ami Mathieu Kassovitz, sensible à cette question, nous avons décidé de lancer une pétition sur Change.org pour obtenir une loi imposant à tous les supermarchés de distribuer leurs invendus. Aujourd’hui, plus de 210.000 personnes ont signé ! Il s’agit du texte à thématique « écologique / agriculture » ayant reçu le plus grand nombre de signatures sur un site de pétition en ligne en France. D’un côté, une classe moyenne qui a de plus en plus de problèmes économiques. En effet, dès le 10 de chaque mois, des millions de Français sont sous l’eau après avoir payé leur loyer et leurs charges. En outre, il y a de plus en plus de SDF dans nos rues. De l’autre côté, chaque supermarché gâche chaque jour plus de 40 kg de nourriture. C’est impensable avec la crise économique actuelle ! Notre proposition a donc été simple et efficace : voter une loi imposant, ou incitant aux supermarchés de donner, soir après soir, tous leurs invendus à l’association de leur choix. 1. Chaque citoyen peut créer une association et déposer les statuts (validés au préalable à la préfecture évidemment) à sa mairie. Celui-ci pourra ensuite s’adresser à l’enseigne de son choix dans sa commune, afin que celle-ci lui remette les invendus pour une distribution le soir même (à l’instar de notre initiative à Courbevoie). Il y aura donc deux sortes d’associations pour la distribution de nourriture : les associations agréées qui peuvent stocker (les Restos du cœur, Secours catholique, Secours populaire, Samu social, Croix rouge…) ; et les associations agréées qui ne peuvent pas stocker en raison d’absence de locaux permettant le respect à la chambre froide. Dans ce cas, ça serait une distribution immédiate le soir même (à l’instar de mon association « Courbevoie 3.0 »). Si aucune association ne vient interpeller une enseigne, l’obligation ou la contrainte ne fonctionne donc pas. Ceci pour rassurer les enseignes et les commerçants. 2. Chaque commune pourra informer les citoyens qu’il y aura cette initiative. Cela permettra de mobiliser de nombreux bénévoles. Exactement comme j’ai fait à Courbevoie (tribune dans le « Courbevoie magazine », communication via Facebook, Twitter). 3. Le surplus de nourriture sera cédé automatiquement aux associations agréés qui peuvent stocker la nourriture. Je rappelle, comme vous le savez, que les Restos du coeur (comme toutes les autres) font des collectes de nourriture en ce moment. Un système quasi-similaire a été appliqué en Belgique, par le député socialiste Frédéric Daerden à Herstal. Ça marche très bien comme vous pouvez l’imaginer. Cette proposition, que nous avons donc testée sur le terrain à Courbevoie peut aider à éradiquer une partie de la faim dans notre pays. De nombreux parlementaires et élus, de droite comme de gauche, soutiennent notre démarche comme Thierry Solère, Pouria Amirshahi, Alexis Bachelay, Frédéric Lefebvre, Nathalie Goulet, Xavier Bertrand ou encore Jean-Christophe Lagarde. Il y a une réelle union nationale autour de notre demande. 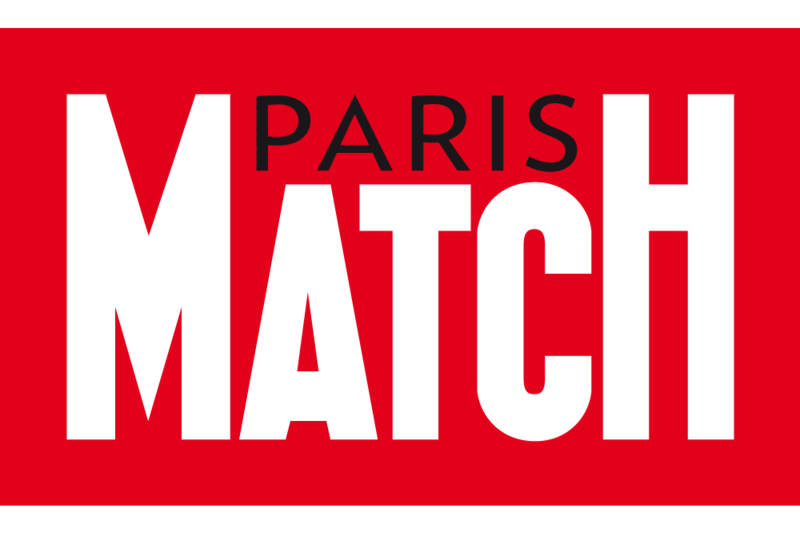 De plus, de nombreuses personnalités tel que Johnny et Laeticia Hallyday, Bruno Gaccio, Anthony Kavanagh, Nikos Aliagas, Omar et Helene Sy, Valerie Damido, Youri Djorkaeff ou encore Antoine et Emma de Caunes. Nous avons également reçu le précieux soutien de l’association ONE France. Cette ONG a été fondée par Bono, le chanteur du groupe U2. En effet, notre combat est international et aura vocation à se décliner sur d’autres continents. Nous avons été auditionné, les 28 janvier et 17 février, à l’Assemblée nationale pour présenter cette initiative. Et le 5 mai, nous avons été reçus à l’Élysée. J’ai reçu le soutien du Président de la République pour notre pétition. Notre pétition a été votée à l’unanimité le vendredi 10 avril dernier au Sénat dans la loi dite Macron. La sénatrice UDI Nathalie Goulet a saisi l’opportunité de cette loi pour y insérer un amendement. Le Senat l’a voté à l’unanimité avec deux précisions : cela concerne les enseignes de plus de 1000m2 et elles auront la possibilité de faire un partenariat avec l’association de leur choix. C’est donc la reconnaissance d’un réel droit opposable et la création d’un encadrement légal pour la distribution directe des invendus consommables. La loi Macron sera votée fin juin. A ce propos, le député-maire de notre ville, Jacques Kossowski m’a apporté son soutien. Je tiens à le remercier chaleureusement. Par ailleurs, le député socialiste Guillaume Garot a repris intégralement notre pétition dans son rapport. Ce n’était pas chose facile car il était opposé à notre proposition de droit opposable. Mais nous l’avons persuadé grâce à nos arguments. Et surtout, grâce à la pression de l’opinion publique. Mais en parallèle de cette Loi Macron, la loi dite « transition énergétique » se présente en dernière lecture à l’assemblée Nationale. Et le député UMP Frédéric Lefebvre, avec d’autres députés (dont le député UDI Maurice Leroy), ont décidé de saisir l’opportunité pour y insérer différents amendements, dont celui inséré à l’identique dans la Loi Macron. 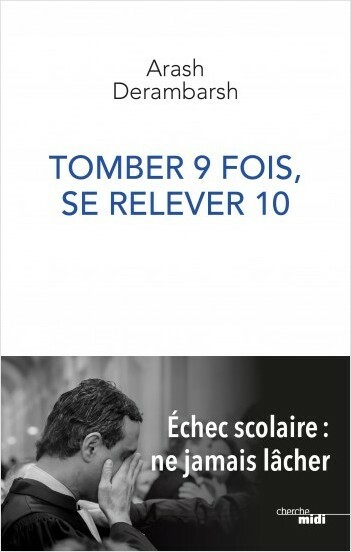 Par ce biais, toutes les enseignes auront l’obligation de donner leurs invendus consommables à l’association de leur choix. L’objectif est de faire passer le dispositif le plus rapidement possible. Et la loi « transition énergétique » est votée en ce moment même. C’est donc une victoire car tous les groupes sont d’accord pour la voter. L’objectif sera ensuite d’expliquer l’applicabilité de la loi à tous les français. J’ai été à Saint-Maur il y a quelques jours. Et je serai au Festival « nourrir sa santé » à Brides les Bains (Savoie en région Rhône-Alpes) du 5 au 7 juin. Cette initiative qui vient de ma ville, Courbevoie, pourra ainsi s’appliquer dans toute la France. Cette loi, pour laquelle je me suis battu depuis de longs mois, permettra à toute la classe moyenne et aux démunis de pouvoir manger et boire sans la crainte du pouvoir d’achat. Et de voir enfin disparaître les scandaleuses images de l’eau de javel sur de la nourriture consommable. La Fraternité a encore du sens dans notre pays. La pétition en faveur d’une loi imposant aux supermarchés de distribuer leurs invendus a dépassé la barre des 210.000 signatures. Elle a été lancée il y a quatre mois jour pour jour par Arash Derambarsh et Mathieu Kassovitz. Il s’agit de la pétition en ligne en matière « écologie / environnement » ayant reçu le plus grand nombre de signatures. 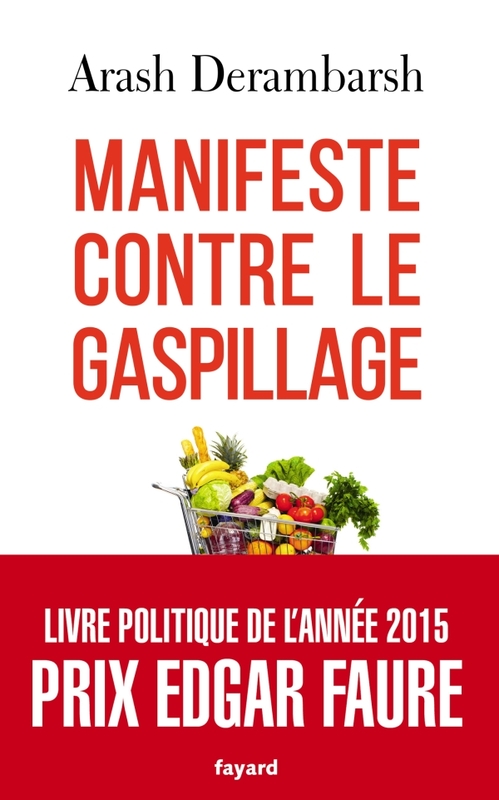 Gaspillage Alimentaire : Un vote Historique ! C’est un vote Historique ! « Art. L. 541-15-3. – I. – Les distributeurs du secteur alimentaire assurent la commercialisation de leurs denrées alimentaires ou leur valorisation conformément à la hiérarchie établie au 1° ter A du I de l’article L.541-1 du code de l’environnement. Sans préjudice des règles relatives à la sécurité sanitaire, ils ne peuvent délibérément rendre ses invendus alimentaires impropres à la consommation ou à toute autre forme de valorisation prévue au même article. « II. – Aucune stipulation contractuelle ne peut faire obstacle au don de denrées alimentaires vendues sous marque de distributeur au sens de l’article L. 112-6 du code de la consommation par un opérateur du secteur alimentaire à une association caritative habilitée conformément aux dispositions de l’article L. 230-6 du code rural et de la pêche maritime et prévu par une convention conclue par eux. « III. 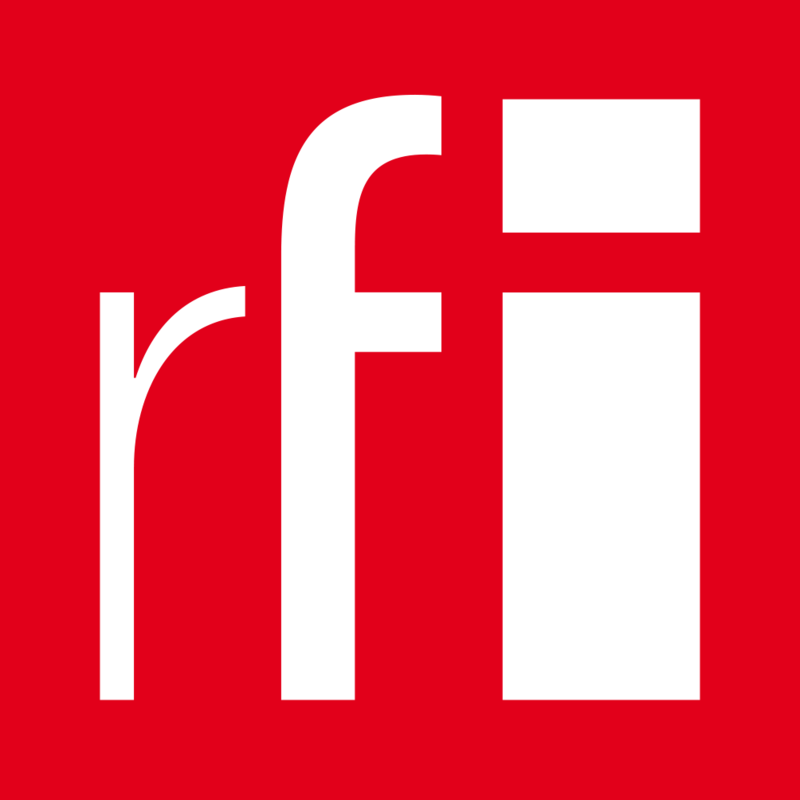 – Le don de denrées alimentaires par un commerce de détail alimentaire dont la surface de vente est supérieure au seuil mentionné au 1er alinéa de l’article 3 de la loi n°72-657 du 13 juillet 1972 instituant des mesures en faveur de certaines catégories de commerçants et artisans âgés à une association caritative habilitée conformément aux dispositions de l’article L. 230-6 du code rural et de la pêche maritime fait l’objet d’une convention qui en précise les modalités. « III. – Avant le 1er juillet 2016, les commerces de détail alimentaires dont la surface de vente est supérieure au seuil mentionné au 1er alinéa de l’article 3 de la loi n°72-657 du 13 juillet 1972 instituant des mesures en faveur de certaines catégories de commerçants et artisans âgés proposent à une ou plusieurs associations mentionnées au même III de conclure une convention précisant les modalités selon lesquelles les denrées alimentaires leur sont cédées à titre gratuit. « Les commerces de détail ayant conclu une telle convention antérieurement à la promulgation de la présente loi sont réputés satisfaire au présent IV. « IV. – Le manquement aux dispositions du III de l’article 22 undecies de la loi n° du relative à la transition énergétique pour la croissance verte est puni de 2 ans d’emprisonnement et de 75000 euros d’amende. Au mois de décembre 2011, Frédéric Lefebvre avait, alors qu’il était secrétaire d’État chargé de la consommation, lancé un appel à la générosité des entreprises de la grande distribution afin que les « Restos du cœur », la « Croix-Rouge », le « Secours Populaire » et la « Banque alimentaire » puissent répondre aux demandes dont ils faisaient l’objet. Cet appel avait permis à ces entreprises de fournir aux associations de quoi fournir des repas aux mois de février et mars 2012. Alors que notre pays connaît une crise majeure et, hélas, durable, les Restos du cœur lancent leur trentième campagne hivernale. Lors de la campagne 2013‑2014, l’association créée par Coluche en 1985 a dépassé pour la première fois le million de personnes inscrites dans ses centres, et servi 130 millions de repas. De nombreuses associations caritatives, dont la Banque alimentaire qui a organisé les 28 et 29 novembre, sa trentième grande collecte annuelle, ont récemment interpellé les pouvoirs publics devant l’urgence de la situation. Comme le dit si crûment le président du Secours populaire : « La faim dans le monde, elle est chez nous ». On dénombre ainsi aujourd’hui 100 banques alimentaires en France et 256 en Europe et leur nombre de bénéficiaires ne cesse de croître. Les associations qui concourent à permettre à nombre de nos concitoyens de pouvoir s’alimenter sont confrontées à un afflux de personnes qui demandent une aide Dans le cadre d’une enquête du Secours populaire de la fin de l’année 2013, 41 % des Français interrogés ont affirmé avoir déjà connu une situation de pauvreté, 62 % des mères seules ont confié avoir rencontré des difficultés à se procurer une alimentation saine et équilibrée, tout comme 37 % de l’ensemble des personnes interrogées. Selon un baromètre publié par l’observatoire BFM Business et Ca Com le 3 novembre 2014, plus de neuf Français sur dix (92 %) n’excluent pas totalement le risque de plonger un jour dans la précarité et 37 % des sondés déclarent avoir des revenus insuffisants pour finir le mois. Ce sont ainsi des millions de Français et d’européens qui font appel aux organismes caritatifs ou qui restreignent, parfois au-delà du supportable, leurs dépenses d’alimentation. Derrières ces chiffres, il y a une réalité humaine qui nous oblige et un constat que nous ne pouvons plus ignorer : un nombre grandissant de Français et d’européens ne peuvent même plus faire face financièrement à leurs besoins premiers. Lors des dernières élections européennes, les citoyens de l’Union ont envoyé un message fort dans nombre de pays touchés par la crise, en votant pour les extrêmes, car ils veulent redevenir prioritaires ! Il est de la responsabilité des décideurs politiques nationaux de prendre en compte cette réalité sociale et de prendre les mesures qui permettront de répondre aux attentes d’un nombre croissant de nos compatriotes. Depuis le mois de décembre 2014, un élu municipal de Courbevoie, Arash Derambarsh, organise régulièrement, après avoir lancé un appel sur les réseaux sociaux, des distributions de denrées invendues des supermarchés de sa commune à des personnes dans le besoin avec le concours d’associations. Cette initiative, qui a permis de distribuer à chaque fois entre 10 et 20 kilogrammes de denrées par supermarché, doit être saluée, mais elle pose la question de la réglementation applicable, car aujourd’hui nombre de grandes surface n’osent s’engager dans cette démarche par elle-même car la loi le leur interdit, ce qui se traduit, dans une France qui a faim, par des gaspillages alimentaires intolérables. Lors des débats relatif au projet de loi pour la croissance et l’activité, Frédéric Lefebvre et Jean-Pierre Decool ont déposé des amendements inspirés par cette démarche, amendements repris avec succès par la sénatrice Nathalie Goulet. Lors des débats en commission spéciale le 15 avril 2015, la présidente de la commission, la rapporteure de la commission spéciale a indiqué que le gaspillage alimentaire était « un sujet important ayant vocation à donner lieu à un grand débat » dans le prolongement du rapport Garot et a fait savoir que les différents groupes de l’Assemblée nationale, finiraient par se « retrouver sur certaines propositions en séance publique ». C’est pourquoi, le présent amendement vise à permettre la mise en place d’une convention d’organisation de la collecte sécurisée des denrées alimentaires invendues, encore consommables, au profit d’une ou plusieurs associations d’aide alimentaire, pour les grandes surface.